Dr. Eddie Smith graduated from the OU College of Dentistry in Norman, Oklahoma, in 1993. He's been practicing in Tulsa ever since - for over 20 years! Dr. Smith believes the best teeth are natural teeth, and makes every effort to help you keep them healthy through preventive and conservative dentistry. When he isn't working, he enjoys spending time with his wife and daughters and serving in his church, where he currently teaches a Bible study class. Our hygienists, Patricia Myers and Margaret Young, both graduated in 1999 and have been with Dr. Smith throughout their careers. Their gentle touch and meticulous care are two of their many qualities! Teah Simpson has worked with Dr. Smith as an assistant and front office manager for almost 15 years. Her knowledge of all things dental is astounding! She is here to assist you in everything from scheduling appointments to coordinating insurance. Ally Herrmann, Dr. Smith's assistant, is the most recent addition to our staff. Her delightful personality is sure to keep you at ease! 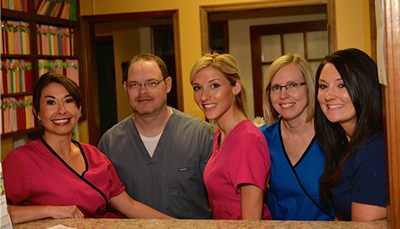 We all look forward to providing the highest dental care for you and your family.